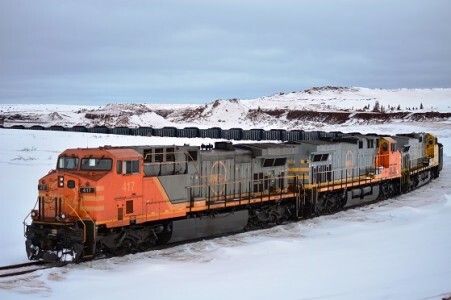 TSMC is also involved with New Millennium Iron Corp.(TSX: NML) in undertaking a Feasibility Study of the LabMag and KeMag iron ore deposits which form a part of the 150-km long Millennium Iron Range in northern Canada. April 12, 2017: TSMC hosted a graduation ceremony at the TSMC Mine Site Administration office to recognize 23 local Community members who successfully completed the Mining Essentials training program, a collaborative and innovative capacity development program which included in-class and job shadowing experiences. 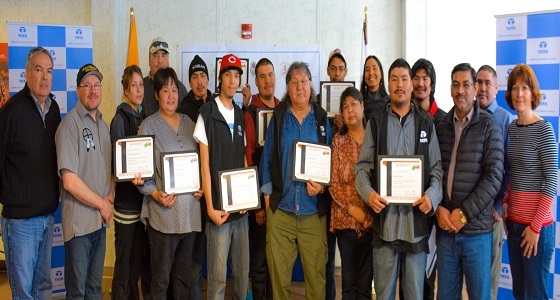 The event was graced by representatives from the Nation Innu Matimekush-Lac John, the Naskapi Nation of Kawawachikamach, the First Nations Human Resources Development Commission of Quebec, the Mining Industry Sectoral Workforce Committee, the Sept-Iles School Board and the TSMC senior management team. April 10, 2017: The 1st train of the 2017-2018 season departs TSMC processing facilities, heading towards Pointe-Noire, Quebec for off-loading at the Port of Sept-Îles by the Société Ferroviaire et Portuaire de Pointe‑Noire ("SFPPN”), in preparation of 2017 shipments. April 9, 2017: TSMC signed a Memorandum of Understanding (“MOU”) with Société du Plan Nord (“SPN”) and Quebec Iron Ore (“QIO”) for the development and enhancement of the infrastructure facilities at Pointe-Noire in Sept-Îles, Quebec via the limited partnership Société Ferroviaire et Portuaire de Pointe‑Noire ("SFPPN”). This collaboration will facilitate the development of Pointe Noire Infrastructure to match the anticipated ore delivery needs of the partners ensuring efficient cost structure enabling the Labrador Trough to become competitive. November 1, 2016: TSMC ratifies its’ C$175 million Financial Partnership with the Government of Québec, which consists of an Equity Investment of C$125 million and a C$50 million Loan. Consequently, the Government of Québec, under the aegis of Ressources Québec, holds 18% Equity in TSMC along with Tata Steel (77.68%) and NML (4.32%). October 4, 2016: Loading commences on TSMC’s 1st ship from the Government of Quebec’s recently acquired Pointe Noire port facilities. August 31, 2016: TSMC signed a Protocol Agreement with the First Nations Human Resources Development Commission of Quebec (FNHRDCQ) to implement a Job Inclusive Training Program specifically developed for Aboriginal Peoples to meet the requirements of the mining industry, under the aegis of the Mining Essentials program developed by the Assembly of First Nations (AFN) and the Mining Industry Human Resources Council (MiHR). July 26, 2016: TSMC has been awarded a Financial Contribution of C$ 175 million by the Government of Québec to support the development of its DSO Project. 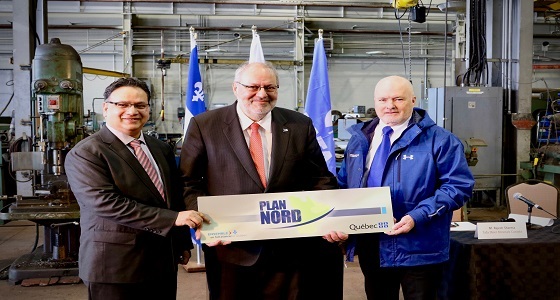 The Financial Contribution includes equity stake of C$ 125 Mn through the Capital Mining Hydrocarbons Fund which supports mining activities in the Northern Region of Québec and a loan of C$ 50 Mn through Investment Québec. July 25, 2016: TSMC became the First Mining Company in the region to rail Ore to Pointe Noire for onward shipments through enabling facilities under the aegis of Society of Plan Nord.